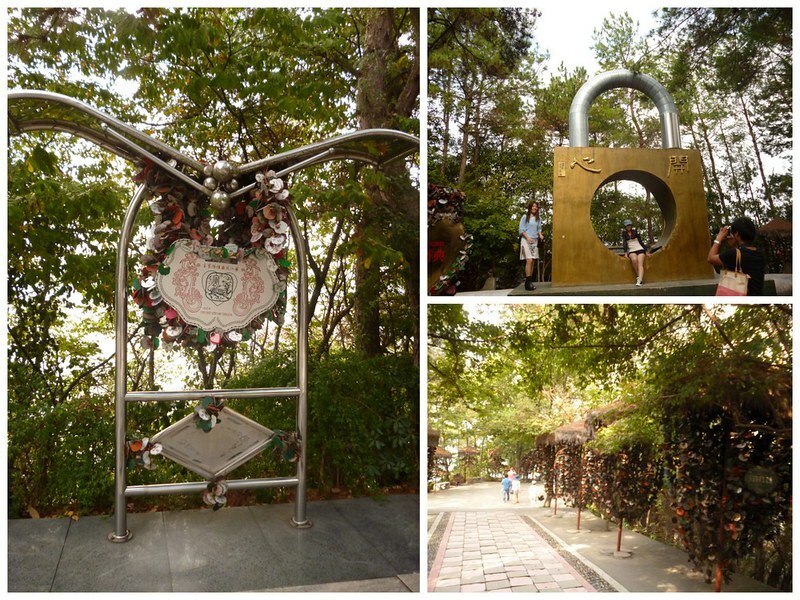 Nicole and I got up early today because we wanted to make it in time for the 8:30am tour of Qiandao Hu (千岛湖). The weather was slightly chilly as the sun hid behind hay clouds when we got out of Whitney’s house at 7:15am. The bus to Qiandao Hu’s tourist harbor was quite empty when we got on. But at the next few stops, more and more people boarded and the bus was full in a short while. The bus took us up hills and down slopes. passing by the lake shore. 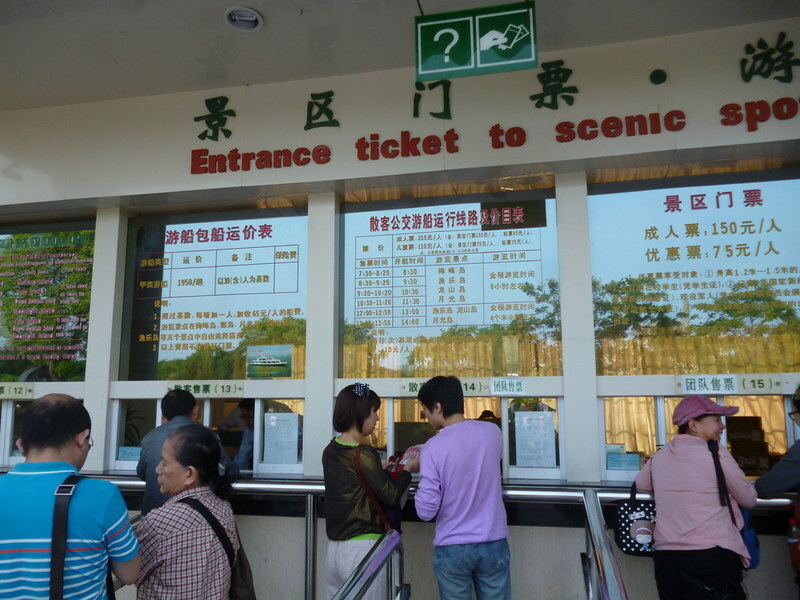 At the harbor, there are counters for independent travellers to buy packaged boat tour of the islands. Even though the lake is called Thousand-Island Lake, we’ll only be visiting 4 main islands (which are made up of about 1 to 4 islands each). Our tour cost 215 yuan (S$43) each, which is pretty expensive considering a very nice meal in a restaurant for 2 costs less than 90 yuan. We had our breakfast picnic of bread while we waited for our tour to start. Most of the people passing by were in tour groups and they each wore a cap in the color of their group. So far, we spotted turquoise, purple and red. Soon it was time to board our boat. Our vessel was a three-decked modern things. When we got on, the employees urged us to head to the third level “to be more comfortable”. When we got onto the third level, we realized that they charge an extra 50 yuan per person for the comfort, plus unlimited refill of tea. The only space we could find with a chair was the table occupied by two couples and a family of three. We each minded our own business for most of the trip. Our ship came with two tour guides. One of the guides said that tour guides are only dispatched to ships made up of indie travellers only when there are a certain number. I think it was only to make us feel better as they probably dispatch guides to every ship that goes out. The lake does have a thousand or so islands during periods where the water level is high. And when the water level is low, there can be up to 3,000 islands in the lake. To tell you the truth, now that I’m writing about the tour, I’ve kind of forgotten what was on the four different islands. I have a vague memory of walking a lot under the shade of trees and taking photos. Luckily, I have photos to jog my memory. Off we go to the first island. 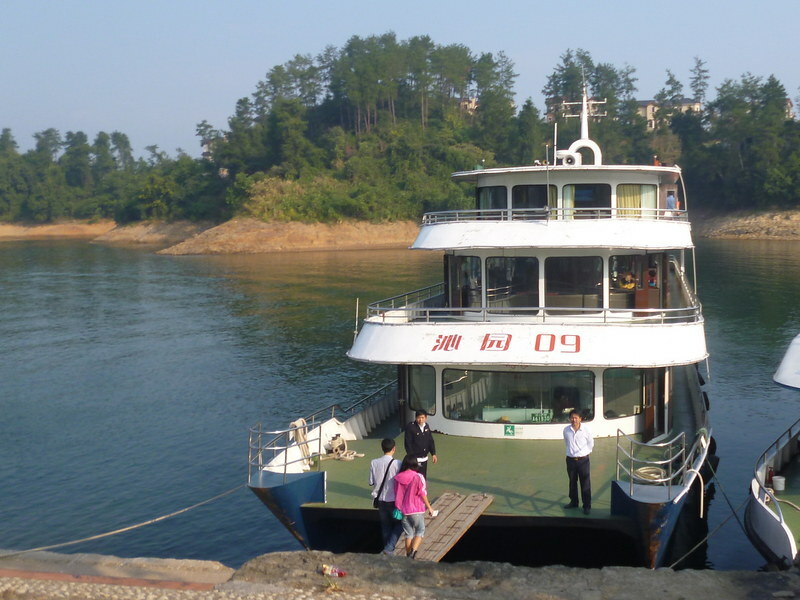 Our first stop was 月光岛 [yueguang dao] which translates to Moonlight Island. I’m not sure why it was named this way but the island consists of about 4 islands and one of which is named Wedding Photo Taking Place (or something like that). Moonlight Island included a lot of locks. What locks you say? Well, those locks you use on your luggage or door to keep out thieves. On the island, they sell locks which you can buy and lock onto all sorts of predetermined places. After the locks, there was a fish feeding area. About a hundred fishes fight for the feed that visitors throw into their little square living area. The fishes fight so hard that many of them are carried onto the surface of the water for at least 10 seconds. I sometimes feared for the lives of those fishes. 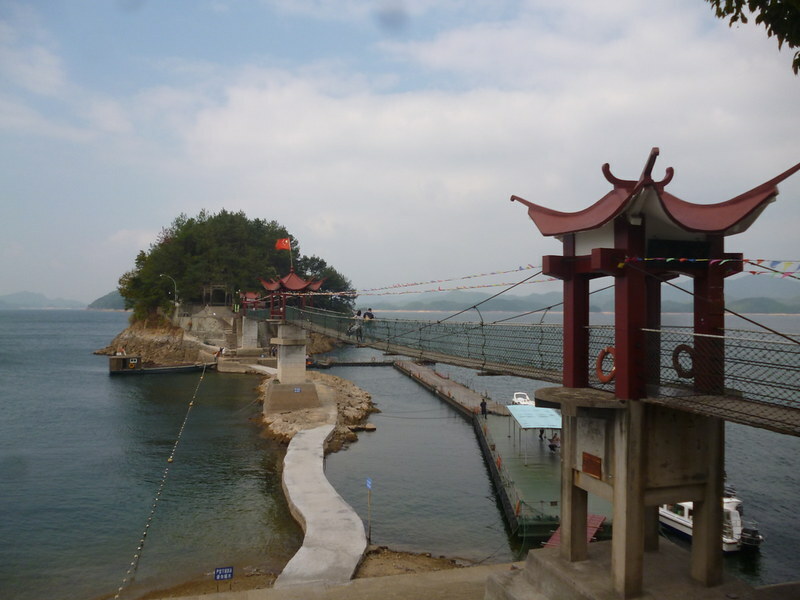 The last part of the island includes a metal bridge called Zhuangyuan Qiao. “Zhuangyuan” is one of the levels in ancient China’s examination system. If you pass it, you have the chance of becoming a government official. Kids and their families are encouraged to pay a fee to cross the bridge so that the child will pass his or her examination with flying colors. Nicole and I skipped the bridge and explored around the harbor. There was a tower with no stairs and a stage with no audience. It was a bit creepy. We got back onto the boat and bought one fried fish for each of us. The fish was supposedly fresh water fish caught from Qiandao Hu itself. It tasted like a skinny fish deep fried in oil. I even accidentally ate the gills before realizing it. Next stop was 龙山岛 (long shan dao) which means Dragon Mountain Island. The island had a couple of pillars carved with dragons which was probably why it was named that way. 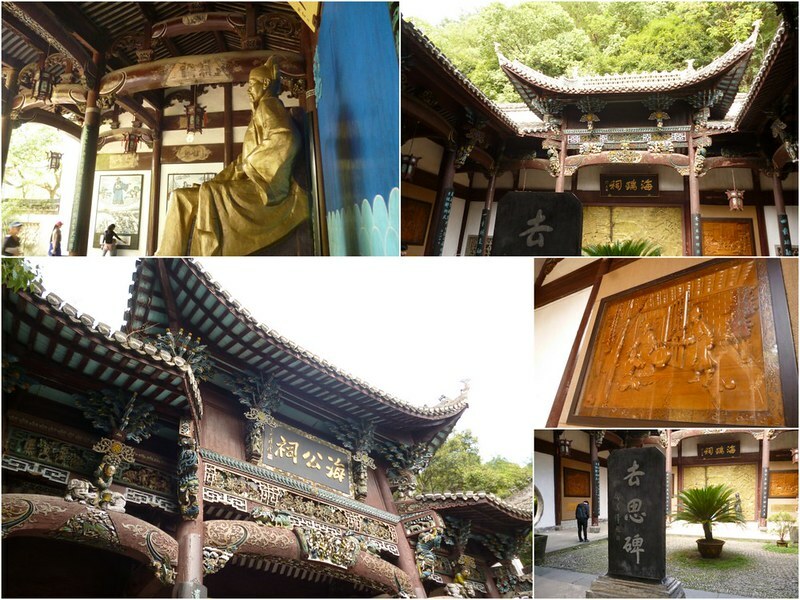 The island was famous for one of its officials back in ancient China. Hai Rui was born in year 14? ?, which explains how back in ancient China that was. He was a very fair government official and didn’t waste his city’s money (unlike a lot of officials then). The people were so in love with him that they built him a temple-for-the-living and asked him to write a few words about it. The island was small so our tour ended really fast. It was off to another island. Our third stop was 渔悦岛 (yu yue dao). The name is a pun on Happy (yu yue). They changed the first word to another “yu” which means fishing. So I guess the name of the island is Happy Fishing Island. On this island, there is a buffet place, a performance stage and plenty of watersports. We were given 1.5 hours on the island because of the various activities. 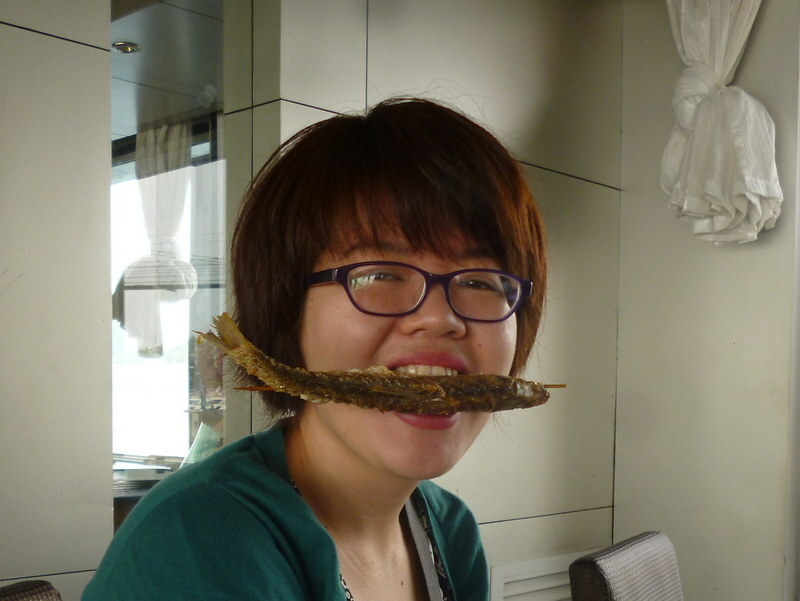 Since Nicole and I brought our own food, we skipped the 30 yuan and 50 yuan buffet and ate our bread. But we did get a 25 yuan ticket into the performance area where we were promised plenty of ladyboys from Thailand, some dancers from Africa, a master of Chinese calligraphy and beauties dancing with snakes. The show was all levels of bad. The best part was one of the ladyboys singing in both a female and male voice, although I suspect the male voice part was lip-synced. The snake charmer ladies wore sparkling gold costumes and held onto their limp snakes. Their dance could only be the result of total non-practice. Heck, even I could go on stage and wave one arm about. The African dancers seemed like a caricature of their culture. They wore “native” clothes and wriggled about. I have a feeling the dancers all have degrees and were only doing this to travel. Another performance by the so-called master of calligraphy was bad too. While the master wrote with ink, the screen played a short clip about him. However, in all of the photos of the master with famous people, it looked like his face was photoshopped on. Even the photos of him in Thailand and Vietnam looked like a bad mix of green-screen and Photoshop. The master did two works which were auctioned off. While the writing was indeed very good, the starting budding price was a ridiculous 500 yuan. The video did promise that the works of this master could go up to thousand of yuan. During one of the shows, no one bought his writing but someone did during the second show. The finale of the show was a performance by 5 ladyboys. After the show, they stood on the stage for people to come up and take photos (30 yuan charge) with them. No one did during the first show we saw and we didn’t stay back for the other show. On Happy Fishing Island, there was also facilities for banana boats and motorcycle for water. There was also a souvenir area where the vendors scream for attention and business. After this “fun-filled” island, I was ready to head back to the mainland. However, we still have one last island to go to. 梅峰岛 (mei feng dao) means Plum Peak Island. This is the most famous island because visitors can capture a shot of many of the other islands. We did try to take some photos of the same angle but it was blocked by trees and the crowd. 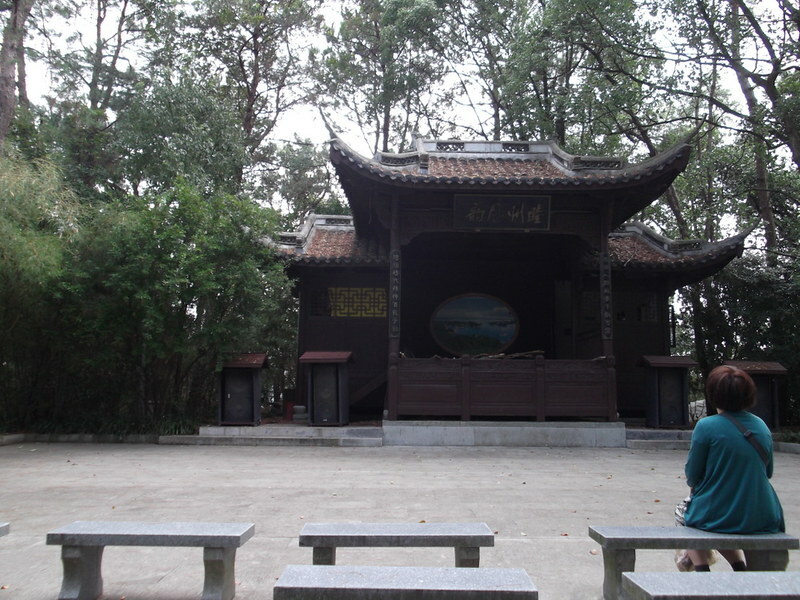 Besides photo taking, the island included a tea house where people are introduced to three types of tea. Nicole and I bought a set of 3 cans of tea and was given a tea set. We have no idea if we were cheated of our money but the tea did taste quite nice. We had to climb for 15 minutes before reaching the peak. As for going down, there is a choice of grass sledding. I didn’t want to walk any more so Nicole went ahead with the grass sledding too. The grass sled was a ratty looking plastic seat and the grass were fake grass. I sat into the plastic seat, stuffed my bags between my knees and grabbed the handle. I screamed all the way down the slope. It was awesome. After the quick ride down, we hung out a while before heading back to our ship. The ship took about 40 minutes to get back to the mainland. Since we didn’t eat a proper lunch, we were very hungry even before the end of the tour. We got off our bus form the harbor and headed straight to the restaurant we visited yesterday. The boss still recognized us and got our order of half a chicken, vegetables and a soup. We ate our meal with gusto and I even had a few sips of Qiandao Hu beer. I found the not-so-alcoholic drink pleasant since I’m wimpy when it comes to beers. After the meal (70 yuan), we went to check out bus tickets for the 3rd when we would be heading to Shanghai. The shop owner didn’t really know how to switch the system’s calendar to October and we helped out a bit. We realized that tickets for Shanghai were not yet for sale and we checked the timing of the buses. We decided to head back tomorrow to buy our 7.45am ride. Our next chore was to buy razor so we could have smooth legs for Lilian’s wedding on the 2nd. Razors sold for an expensive price at the skin care shop. (10 yuan each!) In the end, we got razors for men, still at an incredible price of 9.5 yuan (I could get it for about 3 yuan in Malaysia. Nicole deduced that the low demand for razors caused the price to be high. Indeed, underarm shaving for women in China is not yet the epidemic as it is in the west and in Singapore. 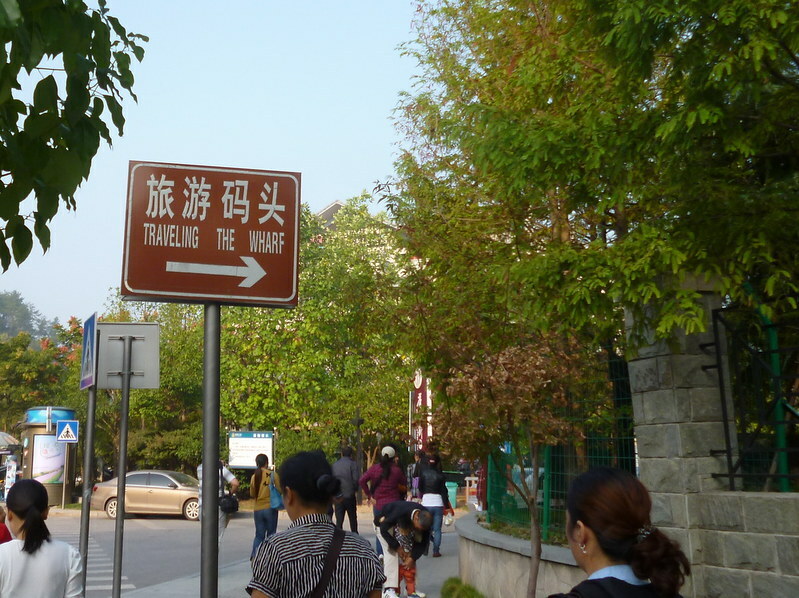 We headed back to Wang Xing’s place where we got to meet her mother-in-law. After our long day, we were ready to retire for the night.